If there is a collection that came out of left field for me recently that has made me fall in love, it's the Urban Decay X Jean-Michel Basquiat collection! This collection you guys...it's amazing. Admittedly, because there have been so many launches lately, I tried avoiding this collection at all costs. I stayed away from reviews and hoped never to see it in person. Then one day I walked into Ulta and there was the entire collection, displayed in the middle of isle and of course, I fell in love with every single piece. That day I purchased a lippe and an eyeshadow palette and went home hoping to order the rest online. The very next day the entire collection went on sale at every store. That's when I ordered the second palette, the face palette and a second lipstick. Whohoo! I would have loved to also own the three eyeliners, especially the red one, but one can only afford so many makeup items, even when on sale. If only I was rich, then I could have it all! But all drama aside, I am SO IN LOVE with every piece of this collection that I did get and can't wait to post the reviews on here for you. Today I am starting with the two lipsticks, one is mine and the other is actually my daughters but I did get a chance to swatch it. The shades we got are Epigram and Exhibition and they are both beautiful. Plus these have the amazing Jean-Michel Basquiat artwork on them, which makes each piece from this collection a work of art. The packaging on these lippies (the entire collection is amazingly designed BTW) is made of super-durable canvas. They actually feel even more weighty and well done than the regular UD Vice lipstick range. Both of the lipsticks have a different design and are just incredible to look at. And, of course you get the same Urban Decay Vice Lipstick formula of always. 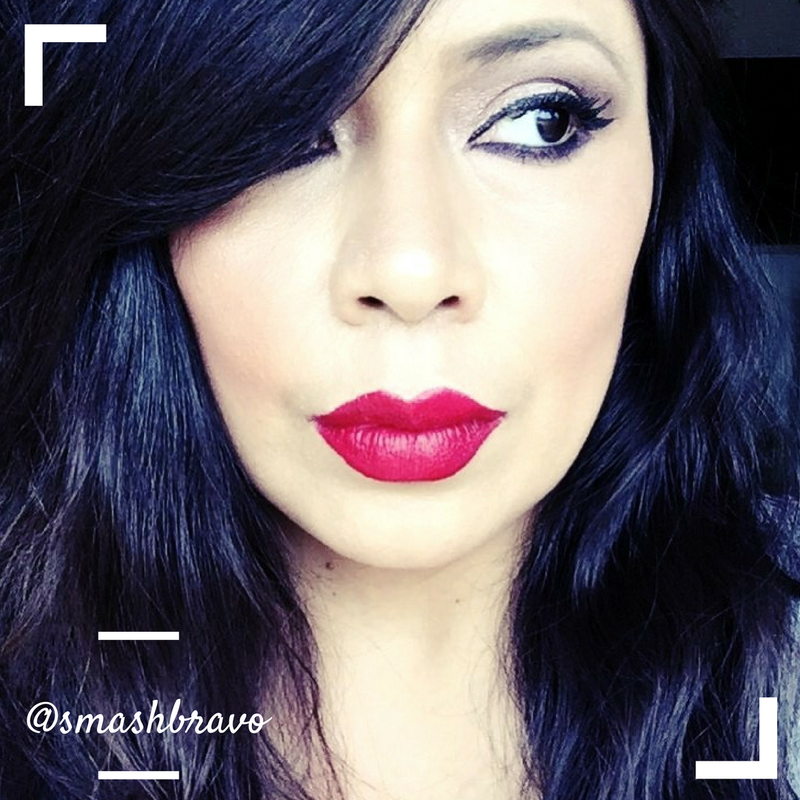 Urban Decay X Jean-Michel Basquiat Lipstick in Epigram is a cream formula that is super pigmented and creamy. The shade is a burnt sienna that will work for any skin tone and it's just gorgeous, I am pretty sure this was the most popular of the three lippies. It's very universal. 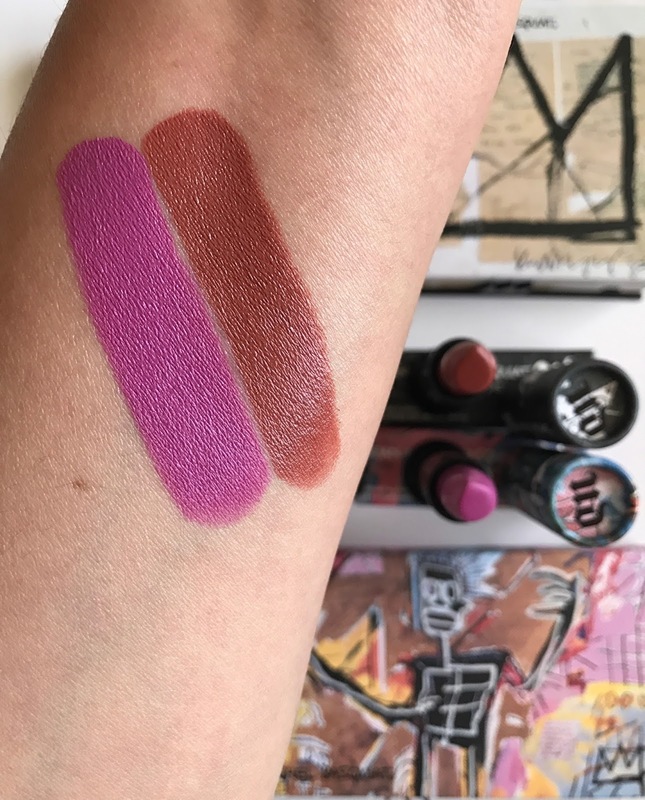 Urban Decay X Jean-Michel Basquiat Lipstick in Exhibition is an orchid-pink shade in the matte formula which is my favorite UD formula. I am a lover of purple tones in lippies and I loved this from the moment I saw it. It's also encased in a beautiful all-black canvas showcasing more Basquiat artwork and it's just super cool. There was a third lipstick that is also really beautiful but looked a little cool-toned for my skin tone so I didn't pick that up. But we absolutely love the two we did get and I definitely suggest you get your hands on these if they are still around. I wish that I could say that I know more about Jean-Michel Basquiat, but I did not know of him until this collection. If anything, I imagine that this collection has brought the amazing artwork of Jean-Michel Basquia to many of us who didn't already know him. I really think Urban Decay did an amazing job with this collection, the products are so good and the design is overall fantastic. Look for reviews and swatches of both Urban Decay X Jean-Michel Basquiat eyeshadow palettes soon!